Synopsis: Like most teenagers his age, Peter [played by Andrew Garfield] is trying to figure out who he is and how to be the person he is today. In his journey to put the pieces of his past together he uncovers a secret that his father [Campbell Scott] held… a secret that will ultimately shape his destiny as Spider-Man. This is the first in a series of movies that tells a different side of the Peter Parker story. 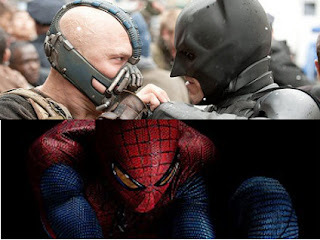 This round is Batman vs. Spider-Man! Round one! Fight! That's tough! They did a really good job with the Spiderman trailer. That said, I ultimately want to see The Dark Knight Rises far more. I have to pick Amazing Spider-Man, because that trailer is, well, amazing. I'll be seeing both movies, very eagerly. I'm actually looking forward to Amazing Spidey more than TDKR...The only reason I REALLY wanna see TDKR is becos of Bane & Anne's Catwoman. Otherwise I think I'm WAAAY more eager to see TASM. The Dark Knight Rises looks like stuff I haven't seen before. The Amazing Spider Man looks like everything I've seen before. Having a CGI lizard man does nothing for me. Spiderman looks AMAZING but I've got to give this one to The Dark Knight. Close contest though. I'm looking most forward to the Dark Knight. I've always liked Batman better. I'm drawn to dark, I guess. One more for Spiderman. Neil, I am too. I've heard that Bane is the exact opposite of the Joker. Completely in control, but still unpredictable. Anne Hathoway has some big shoes to full since Pfeifer did an amazing job. I'm more excited about DKR than ASM. Michael, your right about Nolan's vision. He makes movies like no one else. S.L. Thanks for the vote! It's so funny... I've been so HYPED up to see Nolan's last dark knight that I was obsessed... I'd listen and look out for any tid bit of information, trailers, posters anything that would give me a glimpse of the movie... Then the Avengers came out and BLEW me (and the rest of the world) away and my hopes for dark knight were diminished but still anxious. Now I've just seen the new Amazing Spider Man 4 minute preview and I CANT BELIEVE HOW EXCITED I AM TO SEE THIS MOVIE (And I hate Spider Man)... I want to stay excited about the Dark knight but it's hard when other movies that seem equally as good are dropping around the same time... CURSE YOU MARVEL!!!! John, I'm in the same boat. I thought the new Spider-Man would be lame, but there's some amazing stuff going on in that film. As this is the last of the Nolan Batman films- the end of the arc- I'm way more excited for "The Dark Knight Rises." I haven't fully engaged with the new Spiderman. Too many reboots. SQT it's tricky. I'm still reserving judgement, but so far, so good.